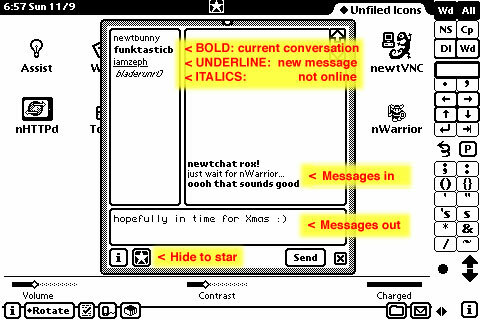 NewtChat is the first Newton chatting program made specifically for AIM. Basic text messaging and buddy list management is all included. A single well organized window gives you quick access to all conversations for tabbed style chatting. Download the demo now, then buy the full version when you get hooked! This demo is the full application, but will automatically quit after 5 minutes. Download and pass around to everyone you know! This full version has no time limit. Now FREE for everyone. I haven't looked at this in years, no idea if it still works. Source code avail for fixing.